* These elegant wedding earrings by Mariell feature romantic freshwater oval pearls tucked into vintage leaf style bead caps. 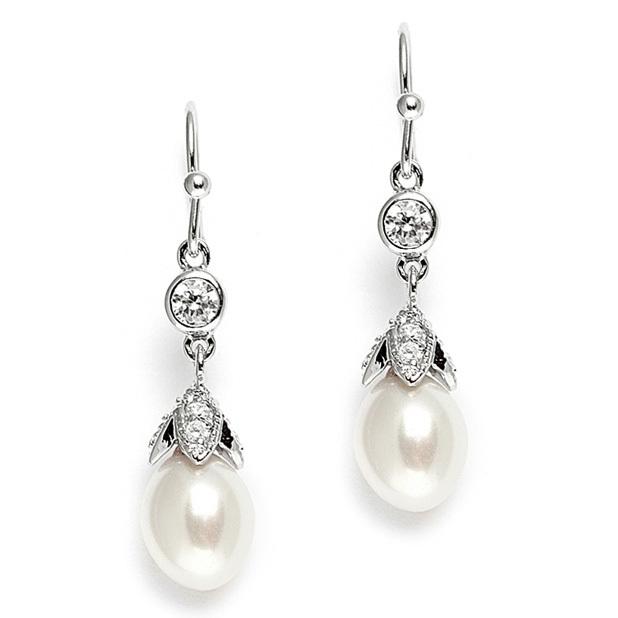 * The pearl drops are paired with bezel set Cubic Zirconia and decorative French wire tops. * These enchanting bridal earrings are popular bridesmaids gifts at a very attractive low wholesale price! * Mariell's romantic 1 1/4" h oval pearl drop wedding earrings have vintage style leaf bead caps. * The silver rhodium wire tops have sparkling bezel set Cubic Zirconia accents. * At an attractive price, these bridal earrings are also popular bridesmaids gifts.